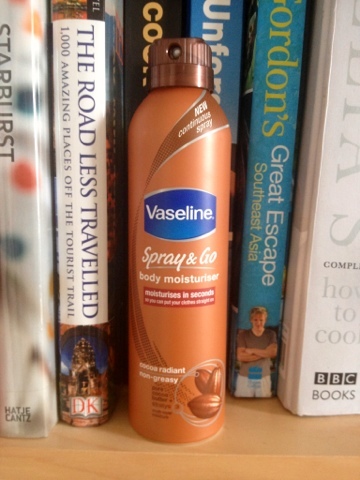 When I first saw the new Vaseline Spray and Go moisturisers it’s fair to say that I got a little excited. I’ve said it before and I’ll say it again, I hate moisturising, I hate waiting around before I can get dressed, so anything that can ease this process is worth a try in my books. I think what I was expecting from this product was being able to spray a light layer and leave it to sink in to the skin without the need of rubbing in. Instead the only process it eliminates is the actual application as you still need to rub the product in. Admittedly I do find it much easier and quicker to use a spray than squeeze it out of a tube. Now on to the actual product- I’ve been really impressed with how smooth the spray has left my skin, I almost expected this to be a bit gimmicky and not work as well as a normal moisturiser. It also sinks into the skin pretty quickly, which is a huge plus for me. I do enjoy using this however I think I still prefer the Nivea in shower moisturiser for speediness. There are three different scents to try the Cocao-Radiant, Aloe Fresh, and a Vanilla one. I think next time I’ll try the Aloe Fresh one and I find the Cocoa-Radiant scent a little too much – if anyone can remember the little squidgy bath melts you used to get in Boots it smells exactly like that! It also has a similarity to the Dream Cream from Lush, which I know lots of people love.